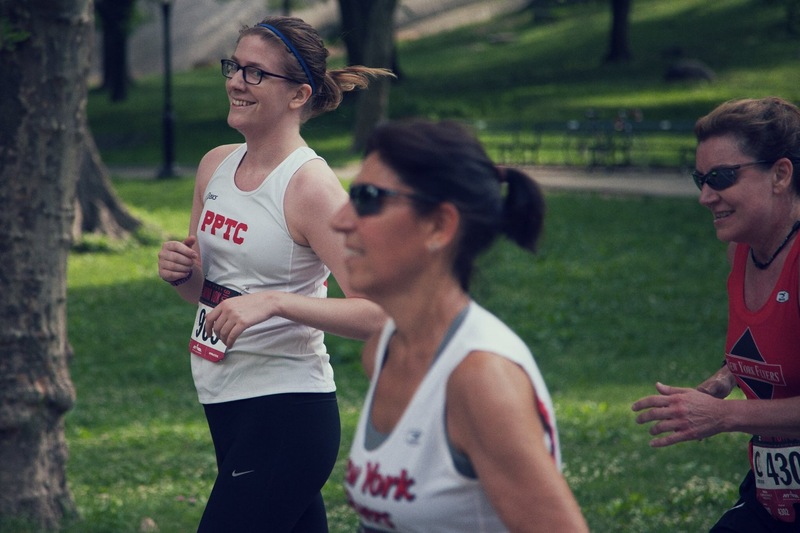 After realizing I wouldn’t quite be in the shape I wanted for the UAE Healthy Kidney 10K, I decided that the Mini 10K on June 11th would give me a much-needed extra 4 weeks of training along with some girl power. I’ve run one other (almost but actually not entirely) women-only race, last October’s Nike Women Half Marathon in San Francisco. I was looking forward to the sisterhood vibes with the bonus of some of our club’s men setting up a cheering section. Unfortunately, I developed a sore throat the weekend after my birthday (June 2nd) then got major congestion that Monday and Tuesday. Things had cleared up by race day, but I still had a lot of phlegm. I (we?) got so lucky with the weather; 63 degrees with 63% humidity, but I knew the humidity and temperature would keep rising throughout the day. I dropped off my stuff (post-race brunch means checking a bag for me, plus I still like to wear a layer there since it’s cooler in the morning), then I found a teammate in the corrals. On the way, a teammate and I watched the Girls’ Race and also spotted Molly Huddle. If we’re being honest, I got a little emotional. A teammate had posted a brief synopsis of this event (started in 1972 as the first women’s race; Katherine Switzer helped start it in her fight for women’s inclusion in racing, this Runner’s World article helps illuminate more). The history of women in sport, and especially in running, tends to get me choked up. Case in point: I can’t re-watch the U.S. Women’s 4 x 100 relay team win and set a world record at the 2012 Olympics without crying a little. I can not wait for the Olympics Trials in early July! Said teammate Gabby is a preschool teacher and I used to teach, so we were so happy for the girls running the 2.25 mile Girls’ Run race. We cheered for them and knew that soon we would be cruising down the same finish route. I was hoping to PR, but knew that my congestion might get the better of me. This was only my 5th 10K ever, as I’m still fairly new to distance racing (my first was in December 2014 and that was the longest distance I’d raced at that point). I really like this distance because of its unique pacing challenges. I have to pace myself and keep something in the tank more than a 5K, but can try for faster speeds than half marathon pace (which admittedly, I would still like to improve upon greatly). Interestingly, NYRR’s new corral system use’s Hill Runner’s pace predictor and according to my 5K PR, I should be able to run a 10K in 54:45. But I’m nowhere close to that (yet). I’m slowly trying to hit more consistent splits of 9:15, then hope to shoot for 9:00 event then break into the upper 8’s. I think I’m just a proportionately faster “shorter” distance person, but am trying to work on races longer than 5Ks this year. I hope to see improvements while marathon training for sure, even though my goal for that is very conservative. 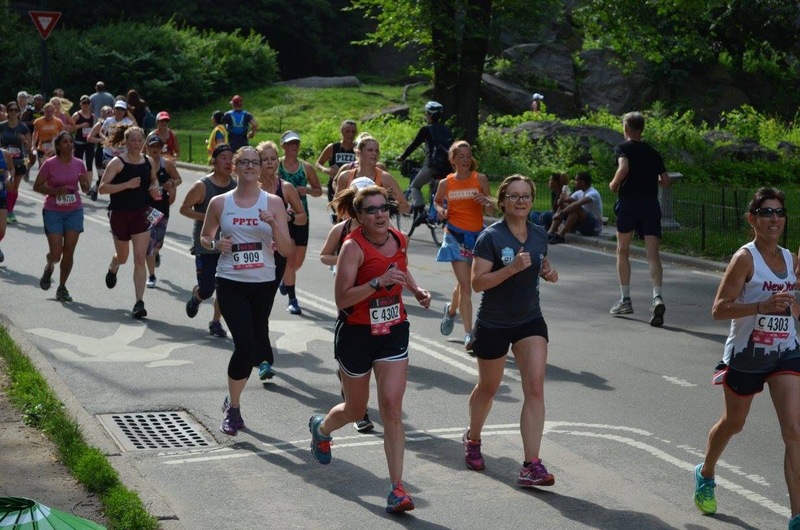 On with the race: It was most of the usual Central Park loop, but we started on Fifth Avenue instead of the loop itself. It was pretty crowded at first but I started to fall into a groove by the time we passed The Met front steps, then entered the park at 90th St.
My paces for the first two miles were the same and very close to my A Goal pace (9:18) according to my Garmin. Unfortunately, both parts of Harlem Hill got the better of me. I slowed way down and my legs felt heavy on the flat parts. I chugged some water and Gatorade while sort of shuffling past the aid stations. I tried to open my stride on the downhill but wasn’t very successful. I figured a PR was out of my reach but chose to press on hard because I knew the PPTC cheer section would be on the last mile. Can’t slow down then! I’m chuckling at my grade adjusted paces from Strava because that 9:47 really does feel like a 9:07, but it’s not. I ran the tangents pretty well and only added on 0.07, as opposed to a full 0.1 from my last Central Park 10K. I high-fived the cheerers and felt great on the last mile and was able to pick up the pace, but not sprint it in. My final time was 58:36, which is a solid enough shave off my 59:04 from the NYCRuns Halloween 10K in October. I got my medal from a volunteer teammate, picked up a carnation (the top of which later got lobbed off in my backpack) and grabbed an apple instead of a pink bagel. After stretching and relaxing in the shade with teammates, I ate an enormous Juicy Lucy burger at brunch. I was one of many PRs Saturday, which gets me jazzed for the next one. Congrats! You should do Zooma Cape Cod with me in Sept.
Congrats again on the PR, especially in a summer race! I hadn’t heard about the course changing; is it now first on 5th Ave instead of CPW?